We recommend checking out our discussion threads on the Technical Pro WASP520LBT 6.5" Rechargeable WASP520LBT, which address similar problems with connecting and setting up Portable PA Systems Technical Pro. The user manual for the Technical Pro WASP520LBT 6.5" Rechargeable WASP520LBT provides necessary instructions for the proper use of the product Pro Audio - Live Sound - Portable PA Systems. 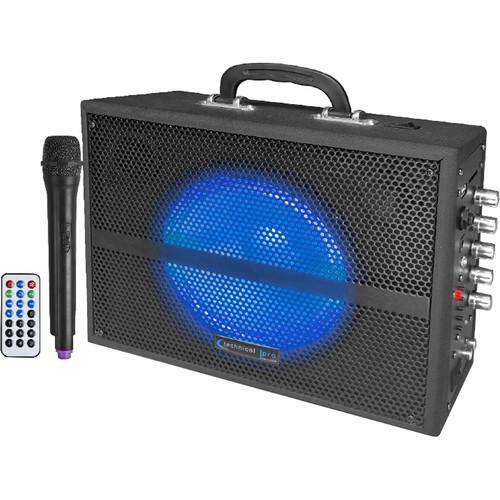 The Technical Pro WASP520LBT 6.5" Rechargeable Battery Powered Bluetooth PA System with Wireless VHF Microphone is an easy to carry, multi-featured all-in one portable PA system. Intended for entertainers and presenters who need a powerful system that can fit in the backseat of a vehicle or stored in a closet, the speaker uses 520W of power to push a 6.5" woofer with a 70 oz magnet as well as a piezo tweeter to deliver full range sound. A wireless VHF microphone with a 50' broadcast range is included. For inputs, the speaker includes USB, SD card, 1/8" AUX, and 1/4" mic inputs as well as an integrated Bluetooth receiver. The USB and SD Card inputs allow you to play .mp3, .wma, and .wav files with ease. A passive RCA output allows you to send the signal from the speaker to other devices. Bass, treble, volume, and mic echo controls let you tweak the sound to your liking, and the unit's perforated steel grill helps protect the woofer from accidental damage. A bright blue LED is incorporated into the woofer for adding visual appeal to your performance. For transport, the unit includes a heavy-duty top carry handle. A remote control is included and an optional 15v car adapter is available for purchase (sold separately). If you own a Technical Pro portable pa systems and have a user manual in electronic form, you can upload it to this website using the link on the right side of the screen. Box Dimensions (LxWxH) 15.5 x 11.8 x 6.7"
The user manual for the Technical Pro WASP520LBT 6.5" Rechargeable WASP520LBT can be downloaded in .pdf format if it did not come with your new portable pa systems, although the seller is required to supply one. It is also quite common that customers throw out the user manual with the box, or put the CD away somewhere and then can’t find it. That’s why we and other Technical Pro users keep a unique electronic library for Technical Pro portable pa systemss, where you can use our link to download the user manual for the Technical Pro WASP520LBT 6.5" Rechargeable WASP520LBT. The user manual lists all of the functions of the Technical Pro WASP520LBT 6.5" Rechargeable WASP520LBT, all the basic and advanced features and tells you how to use the portable pa systems. The manual also provides troubleshooting for common problems. Even greater detail is provided by the service manual, which is not typically shipped with the product, but which can often be downloaded from Technical Pro service. If you want to help expand our database, you can upload a link to this website to download a user manual or service manual, ideally in .pdf format. These pages are created by you – users of the Technical Pro WASP520LBT 6.5" Rechargeable WASP520LBT. User manuals are also available on the Technical Pro website under Pro Audio - Live Sound - Portable PA Systems.